Wonderful Emerald Isle condo that is perfectly suited for a family vacation. This 3-bedroom, 2 bath direct beachfront condo has a private master bedroom for Mom and Dad plus 4 twin beds in the 2 additional bedrooms for all to sleep comfortably. With a fully equipped kitchen that is ready for your use, open living and dining area and a large private balcony facing the beach and the Gulf of Mexico, this condo provides the perfect space for you to enjoy your stay and build family memories. PLEASE NOTE: This is a non-smoking property with the exception of 2 designated outside smoking areas. 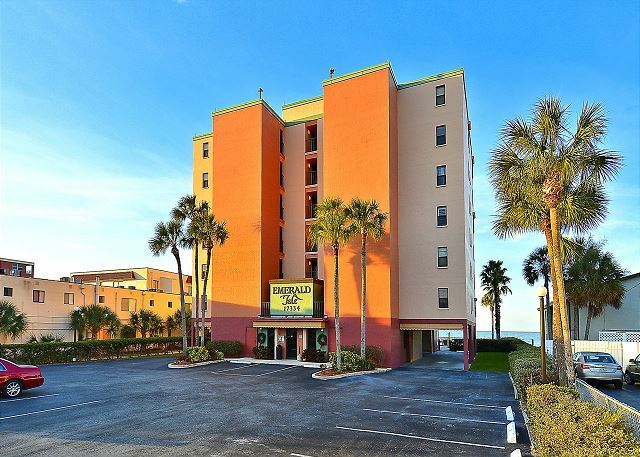 The Emerald Isle is a direct beachfront building on North Redington Beach. This building has 2 or 3 bedroom option condos, all which will have direct views of the Gulf of Mexico from their own private balcony. You will find John’s Pass Village approximately 4 miles to the South which is filled with shopping, restaurants, water activities and entertainment for all. Feel like riding some roller coasters while in town? Busch Gardens in Tampa is only an hour drive away or hit the Disney parks and all the other Orlando attractions in approximately 2 hours. The Florida Aquarium in Tampa, Clearwater Aquarium (Home of Winter the Dolphin), Hard Rock Casino, beautiful state parks and miles of beaches are just a handful of reasons to visit our Pinellas County beaches!!! North Redington Beach is a quaint beach town that is just a short drive outside of St Petersburg; a city loaded with museums, art galleries, restaurants and shopping. Beautiful stretches of beach, great spots for fishing and everything else you need right nearby makes the Emerald Isle a great vacation choice! Exceptional condo. Very clean and well equipped. Fantastic location. 3 adults and 2 children (ages 14 & 17 - but big boys). We loved the condo. There was only a few things that would have been nice. TV's is the 2 twin bedrooms and a washer and dryer in the condo. The view was fantastic and was the weather. It also would have been nice if there was another table at the other end of the pool area. Would love to use this space again. Thank you! Uns hat alles gut bis sehr gut gefallen. Vor allem die neue Küche in der Wohnung hat mich überrascht. Einzig das Sofa und die Sessel haben ihre Haltbarkeit überstanden und sollten dringend ausgetauscht werden. Etwas verwirrt haben uns die vielen Handgeschriebenen Hinweise die in der Anlage hängen.Vielleicht wäre da ein mehrsprachiger Hinweis in der jeweiligen Ferienwohnung besser. We are so glad you enjoyed this condo at Land's End, sorry if the notes left were any troubles for you!!! Thank you for being our guest and we hope to see you back for future visits!! New bathroom this year, new kitchen and appliances last year. Very satisfied with all. Awesome, glad you like the new updates this owner is doing here at Emerald Isle!! :-) Thank you for choosing to stay with us and we will see you back on North Redington Beach next summer!! 4 adults (54, 56, 32, 30) and twins (4) stayed in this condo for 7 nights mid-May. Our family had a blast and made great memories! Great scenery,tons of beach toys and chairs, well stocked kitchen, a very quiet beach and pool area, and all together felt like home! 2 issues: after 7 nights my back was sore as the beds were uncomfortable, but the kids didn't complain! Also, there was an older couple who owned one of the condos who were extremely rude and crabby. They didn't want the little ones jumping in the pool, laughing loud, or music playing poolside (which was Disney songs at a reasonable volume). It made the last 5 days of my stay very uncomfortable and stressful as I felt like I was having to avoid making them unhappy. I know this can't be handled by the owner of the condo we rented, but it absolutely ruined the rest of my stay. I would avoid this complex unless you're looking to just relax quietly, sit poolside, drink water, and read a book your entire vacation. We love that you made great family memories, that's what it is all about!!! :-) We are so sorry for any discomfort that came from the neighbors, that is disheartening to hear and we are so sorry for this. It is true that we cannot really fix grumpy, but we are so sorry they made you feel like this and we hate to hear it!! Outside of the neighbors we hope you cherish those memories, thank about the beach and come back for another visit to our lovely area! We loved the location of the condo on the beach. We had dolphins swimming outside a couple mornings. The condo was well stocked with everything you could imagine. The only downside was swimming is not allowed after dusk, so our kids were bored after dinner and the laundry rule of nothing after 10PM was difficult when you are a family on the go and want to do laundry at night and not waste your day doing laundry. I would also recommend turning the pool heater up when the weather drops into the 40's at night and 60's during the day. Several people were complaining about the water temperature. Thank you for your post and feedback from your stay. We do apologize that the condo association has those pool rules in place and that the pool is closed in the evenings, this is something very common at the different condo buildings. In regards to the laundry, we definitely understand that you do not want to spend day time doing those things as you want to be out on the beach enjoying the day!!! This is only in place due to the laundry facilities being near another condo so that really is just for courtesy to the nearby condo, but we again understand that the timing then worked better for you so we are sorry for the conflict. Outside of that, we are glad to hear you enjoyed the location and that you saw dolphins going by, they are always so awesome to see!! :-) Thank you for being our guest and we hope to host another vacation for your family in the future! This was a three moms/three teen daughters spring break trip and it was very nice. 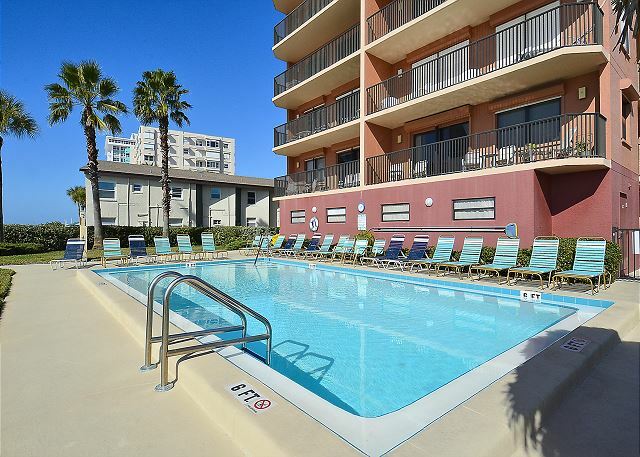 North Redington Beach is away from the craziness to the north and south and this condo worked out just fine for us. It was very pleasurable except for weather being unseasonably cool. The condo was more than exceptional and we would not hesitate to stay again. So great to hear!!! Yes, we did for sure get some cooler weather this season......but it is much better than snow! ;-) We are so glad you enjoyed this condo and we hope to have you back for another visit soon! We were a family group of 22 people in several condos. Emerald Isle 103 had a newly remodeled kitchen and it enhanced the experience. We have been staying in this same condo for several years now and we are very satisfied with the description, the location and the accommodations. I would highly recommend it and have already reserved it for next year. We had an awesome week vacation at Emerald Isle. The beach front apartment was clean, well maintained and had all basic equipment in the kitchen. It is a short drive to great shopping and restaurants. Great for a family vacation. So glad you had a good family vacation at the Emerald Isle!!! :-) Thank you so much for being our guest and we hope to have you back again soon! 3rd year in this condo.... love it! easy management company easy to deal with. location is great. brand new kitchen... beautiful all around!! Thanks for the post! :-) We are so glad you enjoy your time when you come here, it really is a great spot on an AWESOME beach! Thank you for being our guest, we enjoy having you and look forward to the next visit! Nice large unit. Very clean. Great view of the gulf. Good restaurants nearby. The only downsides were the elevator is very loud when people are sleeping and you have to have keys with you at all times to get in the building, the pool, the beach, etc. It was easy to get locked out of the property. So glad to hear you enjoyed the location and area of the Emerald Isle! We are sorry if the elevators were noisy at all during your stay, we are happy to mention this to the condo association as they do the maintenance to that portion of the building, thanks for letting us know! :-) It is a secure building so keys are needed to get in and we are sorry if that was any inconvenience to you. Thank you for choosing to stay with us and we hope to see you on our beautiful beaches again soon!! Great place to get away from the winter. A Beautiful Place In The Sun! This condo was lovely. The view was exquisite! We hade a great time! The only complaint we had were the beds. They definitely need to be replaced. 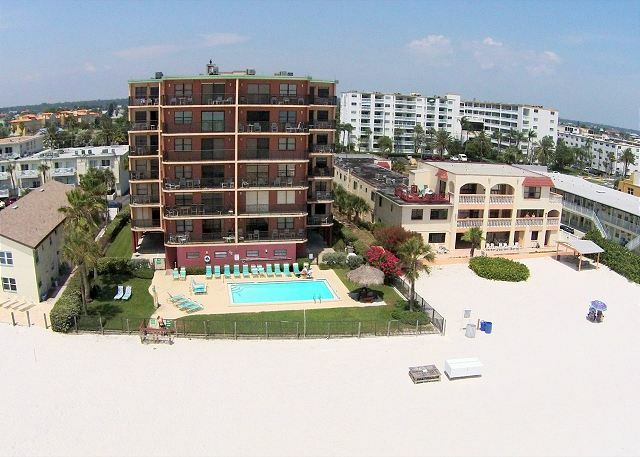 We are so glad you enjoyed this beachfront condo on North Redington Beach!!! :-) We understand that everyone's preferences in the bedding department do vary but we will be sure to pass this over to the owner for review. We do apologize if they were not a good fit for you. Thank you for choosing to stay with us and we hope to host another beach vacation of yours soon!! We loved the condo. Very comfortable and clean. Friendly staff and overall a wonderful experience. Thanks for the post! We are so glad you enjoyed your time and thank you for the comments about our friendly staff! :-) We look forward to your next visit with us! We stay in the Clearwater area for a month every winter and this has been the best rental for the money by far. The beach in front of the unit is very clean and not busy at all, much more residential in feel. The unit was well equipped, especially the kitchen. We cook a lot and did not need to buy any additional equipment for use. The only down side and it is nit picking is there is not a hot tub, and the unit does not have a washer/dryer available in the unit. There is one available in the building on different floors. But having children and lots of clothes to wash that was a minus having to use a pay machine. Otherwise the building was nice and has only 24 units so you didn't have tons of people all of the time. Thanks for the post!! We are thrilled to hear you enjoyed your stay on North Redington Beach! You are absolutely right that this stretch of beach is just awesome! :-) We can definitely appreciate the feedback regarding the washer and dryer not being in the unit, this is one building that does not have that feature in any of the condos there. We have a number of other properties in our inventory that have the same kind of set up as the Emerald Isle that also include in unit washer and dryer, for your next visit just give us a call and we are happy to let you know which other direct Beachfront properties could accommodate with that! The same with the hot tub, we do have a few locations that do have a hot tub on grounds but not every building has that option. Thank you for being our guest and we hope to host your next beach vacation!! We stay here every year on this week. Nice place and will be booking for next year shortly. It is a good place, the interior of 103 needs to be updated and the key situation was bad. I would suggest some type of key pad. The interior of 502 was great. We had a wonderful time again at Emerald Isle. The beach access can't be beat. The condos are a bit dated but, we love staying here. Thank you for your post on this! We will be sure to have our staff take a look at the items you mentioned here. We appreciate you letting us know!! a week in the sun! plus a wee tropical storm! We stayed in the same condo as two years ago and had a good experience. Clean condo has everything we needed but is starting to look a little tired and old. Stayed in 103 for four weeks in February. Had a great time in Florida and the condo was perfect except for the fact that tenants are not permitted to use the washer and dryer in this unit. Other than that inconvenience, everything was perfect and we enjoyed sitting on the balcony and watching the Gulf. In general, we were very pleased with our stay at Emerald Isle #103. Emerald Isle is in a good location on the beach. The only observation my wife and I have is...the furnishings, appliances, carpeting, and décor are in need of some freshening up. By no means were they in terrible condition...we simply felt that it may be time to spruce up the interior of Unit #103. The bottom line for us is, we would definitely stay at Emerald Isle again! We had such an enjoyable time there. I would love to go back next year. We went to the Sea Breeze restaurant quite a few times for the early bird specials. It was fun even in bad weather because of the water view. This condo was in the perfect location! Away from the tourist area and nice and quiet! We will definitely be back for sure next year. if you are looking for a great family vacation or just want to relax this is the place. It is laid back and not aloud party area. The beach is wonderful, you can walk for miles, watch the Dolphins, swim and take in beautiful sunsets. There are plenty of restaurants in the area and a trolley that goes up and down Gulf Blvd. The property itself is well maintained. Although the key situation is a pain, it makes it more secure. You need a key to not only access the building but the pool area. The pool is nice and there are boogie boards and sand toys available. The room has 3 bedrooms, a television with On Demand capabilities, a kitchen with most of the pans you would need and an awesome view. Like most rentals it's not brand new and could use a little work but it's in relatively good condition. Like the place. Have stayed here several times before. However, the wifi was horrible. Need to get it fix. My family and I stayed at Emerald Isle #103 during the week of July 20, 2015. The condo was perfect, as was the beach. If you are looking for a quiet, family friendly beach, this is the one. Even during peak season, the beach was never busy. The condo was even better than pictured. There was plenty of room for our family of 5. There were two beach chairs in the room, and two umbrellas. We brought a 10x10 canopy, and had plenty of room to set it up each day. We loved our week, and are definitely looking to come back as soon as possible! Some people have complained about all the gates to unlock, but it really wasn't an issue. If anything, it just made us feel safer. Thanks for the wonderful and relaxing stay! The property is an excellent location and the unit is very nice except for one big detail. The sliding glass door to the balcony is and has been the last 2 years very difficult to open and close thereby limiting use of the balcony, which is a major amenity. I would recommend the place if the door were fixed. Would stay there again. Loved the condo. It was very easy to book. No issues finding the resort rental office or emeral isle. Friendly staff at the resort office. We've started here before and will continue to return. For the third year in a row we enjoyed a wonderful time at Emerald Isle. The weather helped by being perfect for the whole month of March. The building is perfect because it's small so the pool area is never too busy. The unit was for the most part well appointed and had been upgraded since last year. The living room furniture is wonderfully large and comfortable. However, a few improvements need making: the dining room suite could be replaced (the chairs are much too low! ), the main bedroom bed and bedding need replacing and some of the kitchen dishes should be replaced. But we had guests twice and there was lots of room, with a much appreciated second ensuite. We have booked for next year because we like the building so much. The company was great, the employees in the office were friendly and helpful. Little bit of a drive to pick up and drop off keys. The condo was clean, well equipped and the pato overlooking the gulf was wonderful. I would definitely return. The keys are problematic, you need them to get into the pool, out to the beach, etc. so problematic but good security. Our experience was overall good. The location was perfect. NEED THREE KEYS FOR SIX PEOPLE. BLIND ON SLIDING DOOR BROKEN. Thanks for your review. I appreciate you sharing what you liked about the condo as well as suggestions on areas that you feel could be improved or enhanced. In the future please do not hesitate to call us if anything in broken. We usually can have most problems resolved within a day. Thanks again! This was my first time on the gulf and lived it. Emerald Isle condo was perfect location for a week at the beach. Watched the waves while having coffee on the first floor balcony every morning then walked down to the beach once the children were up. Overall a clean and comfortable condo but do feel the furniture in the twin bedrooms could be better shape my daughters headboard banged against the wall every time she moved so had to pad it with my clothes! Would definitely return in the future and would recommend resort rentals who couldn't have been nicer. We also had a wedding to attend at the doubletree which was an easy walk. Pool and grounds and front lobby kept pristine ! Thank you for a lovely vacation! Thanks for such a great review! Sorry about the furniture in the guest bedroom. Next time please don't hesitate to call us. We can send maintenance out to address most issues. Thanks again! Great family atmosphere. Off the beaten path so beach was always empty. Close to grocery store and amenities. Amazing view!! Never having vacationed in Florida, I wasn't sure what to expect. I knew I wanted a place that was on the ocean, but also had a pool and that wasn't going to be running rampant with drunk teenagers. Emerald Isle #103 was the perfect spot. 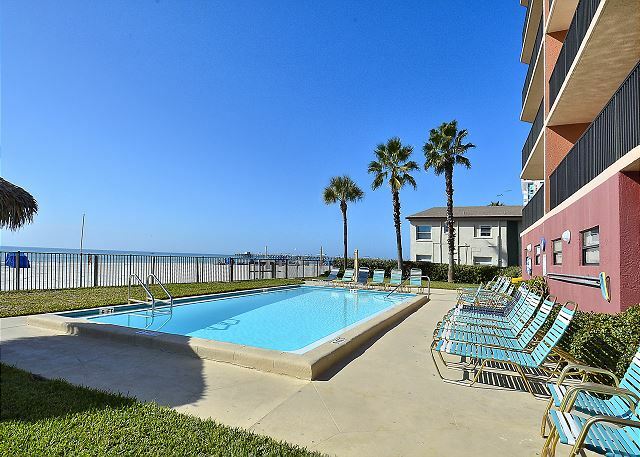 The condo sits right on the beautiful beach which made it easy to take walks or just lay out. It was an easy drive to John's Pass or to other shopping areas. I highly recommend staying at this property and look forward to next year. We stayed in a three bedroom condo which included 6 people, 2 of which were teenagers. We were only given two keys for 6 people. The complex was in complete lock-down and I felt like I was imprisoned by the keys. To get to the beach, we had to unlock two locks (not too bad). But to go from the beach to the room, we had to unlock four locks (terrible). I love the idea of security but please change the lock and key system to touch-pad system with a code. When we arrived and picked up the key the folks in the front office were wonderful. We had high expectations and all of them were met at the great location, the cleanliness of unit, and the overall amenities that were provided. We were on the beach and could hear the ocean waves even with the doors closed which was very relaxing. Everything about the week was absolutely perfect! Lovely Four Weeks on the Beach! We had a wonderful stay at Emerald Isle in a 3 bedroom apartment. It allowed us to have our family down for a visit with ample room and very adequate furniture. However, the dining room furniture,kitchen equipment and beds were rather "tired". It looked as if they had been there for a couple of decades. In contrast the living room furniture looked very new, and was VERY comfortable and appropriate for the number of people occupying the unit. Overall a lovely visit, and we have renewed for next year, despite the drawbacks mentioned above. The floor plan in the 3 bedroom unit allowed us to entertain with a brunch for 20 people and all were comfy. Resort Rentals is my go-to agency now. They were great! My mom, my sister, my daughters and I had a wonderful week at the beach. The building was very secure. The unit was clean enough. Good beds and nice linens. The 2 bedrooms having 2 twin beds was a plus for our group. Dishes were sketchy, we are real cooks and the supplies were campish. Everything had to be washed before we could use it. Had a problem with tv and towel shortage. Fixed immediately. Location is perfect. Rent with confidence. Comfortable and functional not as dated as pictures show. The property is very nice, convenient, and comfortable. The sliding glass door is very difficult to open and close. Apparently needs new rollers. An easy fix for a hard to operate door that was the same last year. Excellent location, property management company was a few miles away but very pleasant to work with. Keys to get in and out of the building, pool bathrooms, and gate to the beach were a pain - only worked half the time and who wants to be fiddling with a key that doesn't work when you have a toddler that needs to go to the bathroom :/ Sliding doors to the balcony were a little difficult, just need some attention from maintenance. But really, complaints are minimal from me when I'm at a place sitting right on the beach, with a clean pool, and a small number of units so there's not a huge crowd. Beautiful week! a guest from Baysville, ON does not recommend this vacation rental. The locks on the gates were very hard to open with some of the keys provided, esp. the oceanside of the gate closest to beach. Their are several chairs around the pool that are missing straps. This year seemed a lot rowdier than last year with noise at night and in the pool. Suggest considering adding 1-2 additional tables around the pool. The grass space is used very little and the only table was frequently occupied. The concrete walkway at the gate leading to the beach has settled and holds water, plus it is a trip hazard. It might be beneficial to add a wash point on the wooden entrance from the beach thus keeping the sand out of pool area. It might solve settling issues. Thanks for your review! I will pass on your suggestions to the condo association. Hopefully they can review them at their next board meeting! Have just returned from a wonderful week at Emerald Isle. The condo is in an amazing location, right on a beautiful white sand beach. It has a huge balcony with chairs and a table for eating at although the floor is carpeted which we found a little odd and rather unhygenic! The swimming pool is next to the beach and was spotlessly clean and well equipped with sun beds. We were however a little confused with pool times - the times displayed in the villa were different to times displayed by the pool and another resident told us that the children were in the pool too late one evening which made us feel very uncomfortable. It is within easy walk to a fantastic resturant called The Conch Republic and a short drive to a choice of supermarkets. The appartment was a little dated inside and two of the bedrooms were very dark with windows that looked out into the internal communal hall way. However it was very well equipped with beach gear including chairs, body boards and buckets and spades which was an added bonus. Over all it was a fantastic holiday destination. Was so easy to book this property! We had our grandchild and 2 sons/families stay with us and it worked out well. Property was well cared for and very clean when we arrived. Those we met who owned other apartments were friendly. The pool really was heated as described and our grandchildren loved it as we did. The only thing I would change would be to make sure the keys work. We luckily had 2 sets so we could always use the other one. We felt very safe with the 'key' system however. The beach is exactly like the pictures show-beautiful! Would defintely come again! The unit was very nice with beautiful sunset views. Also, I believe the unit was built well with good windows as it can withstand the wind and rain well. Maintenance was good and timely. The elevator was nice along with the garbage disposal and laundry. Whoever built the condo's thought it out very well. We had a great time-wish we had more information about areas to dine and things to do. Condo very secure, but needed more keys for entering. Our week stay at Emerald Isle #103 was fantastic. The condo was large, clean, and had ample storge and closets. The rooms have recently been updated so the web site photos do not do the property justice. The location was breath taking as we sat on the balcony every morning for coffee and at night and felt like we were right on the ocean. We even had dolphins in front on 2 occasions. The building is very nice and in a perfect spot. I would recommend this to anyone and would definately stay here again. We stayed for a week in mid July and truly enjoyed our stay. The unit was very clean and large in size. Highly recommend. Excellent location and view of beach/ocean. Nice and roomy. They don't furnish daily towel and linen service, we found that out after day two and called the property management office and were told we would have to wash our own sheets and towels. There are washers and dryers on the 2nd 4th and 6th floors which are coin operated and you hope that no one is using them at the time you need them, there are only one pair per floor. They don't supply hair dryers either. The dishwasher didn't clean well so you ended up washing dishes by hand after running them through. We also didn't know that the office has tons of brochures and maps until we checked out and returned the key. We got in late and used the lock box outside the office to get our keys. Call ahead of time to ask what is furnished and what is not, don't learn the hard way. Other than the few bumps we had, it is very private and nice. We would stay there again. Bed linens were very threadbare and 7 bath towels were not enough for 6 people. Also felt that they could have provided beach towels. Hello Frank....Thank you for your comments and we are happy that you enjoyed your stay at the Emerald Isle. Let us know next time if you need extra towels or more sheets! Unfortunately non of our Condos supply beach towels. People seem to easely forget them on the Beach or some might even take them home! Thanks again and hope to see you next year again! David W from Wauwatosa, WI does not recommend this vacation rental. 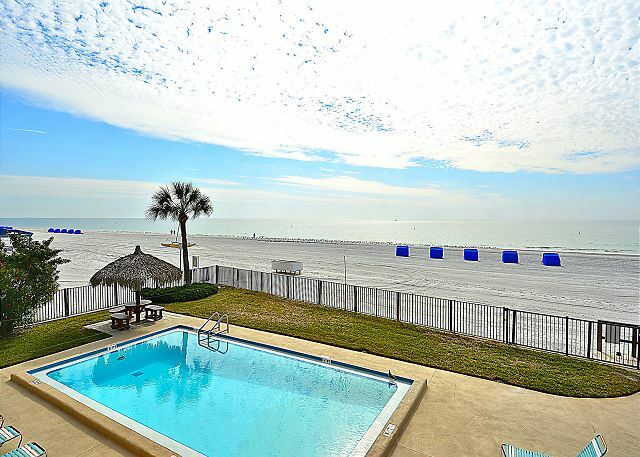 Property was located right on the beach and midway in the gulf area for an easy drive to Clearwater and/or St Pete. Condo itself was a bit dated and could use some new furniture. We did enjoy our stay at 103 Emerald Isle. It was a bit frustrating with the locked gate issue. You had to have a key to get in and get out, maybe less frustrating if there was a key pad. I don't think the locked gate would keep anyone out - the fence is only 4 ft high, so it just affects the guests trying to get to pool and beach with arms loaded up. Just inconvenient but still a great visit. On friday, someone (the owners?) came into tohe rooms with NO advance contact to switchout 3 chairs on the balcony. We were at the beach at the time and just happened to see them on the balcony. This was a little upsetting since no one was in the room and we didn't know anyone was coming in. The condo was very nice. The furniture in the living room could use a little freshening. Very dingy! Silverware and dishes could be replaced. Over all the condo was great and the bedrooms had been freshened. Would stay there again.